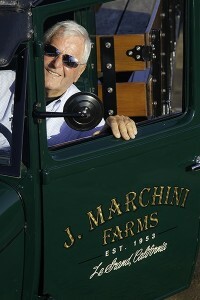 Joe Marchini, of J. Marchini Farms, was born in 1938 to Italian parents who farmed and packed tomatoes in Le Grand, Calif. Marchini has lived and worked in that locale for his whole life, exemplifying a high level of spirit and accomplishment. His father, Florindo Marchini, brought his family over from Tuscany in 1920.” They settled in Le Grand because Florindo’s brother was already living there when Florindo first arrived. Before long, Florindo met a long time grower by the name of Carlo Giampaoli who invited Marchini to grow tomatoes and bell peppers with him. So Giampaoli took Florindo Marchini under his wing, and his brother as well, and established their farm, Giampaoli-Marchini Company. Together, they packaged tomatoes under the Live Oak brand because they actually packed the produce by hand in the shade of a live oak tree that still thrives there today! “My two brothers, Richard and Leonard Marchini, went to school with me. None of us could speak any English; we only spoke Italian,” Marchini said. So they all learned English in a small schoolhouse with two classrooms and one teacher. “My dad grew tomatoes on that land for two years and then planted 40 acres of almond trees. The almonds were harvested green and then dried down by air.” Of course this was before mechanical shakers were used to harvest, so it was done with mallets and tarps. “It was very tough work,” noted Marchini, “and the price of almonds was less than 60 cents a pound.” Marchini credits Blue Diamond Growers, a cooperative he joined, with marketing the almonds so prices could increase. Unfortunately, the seeds he brought back did not grow well. “Radicchio production wasn’t perfected and the source I had in Italy did not tell me what season the seeds were for.” Marchini’s radicchio would grow and form green leaves but not make a head. So Marchini went back to Italy, 40 miles southeast of Venice, to talk to growers, but no one would talk. “I certainly could not tell the guys that I was going back to the U.S. to grow the crop,” he said. Marchini finally found a couple of growers to ship a 100-pound sack of seeds to San Francisco for him. “I picked up the bag, planted the seed and the same thing happened—it didn’t grow.” He called the Italian growers and asked how many different radicchio varieties they were growing. They told him eight varieties. “I asked them why they sent me only one variety, why they did not tell me when to plant the seed, and if they wanted me to buy more seed, they had better tell me what varieties to grow,” he said. “Since I spoke Italian, the growers started to open up. Eventually, I brought them to the U.S., and we partnered up to grow radicchio. I even sent them to Mexico because they thought they could produce an earlier crop than in California,” Marchini said. After reaching mediocre success for about four years in Mexico, they moved back to California to work with Marchini, now without a partnership. The company now productively farms in Mexico with the right seed. “We farm in Mexico for the winter crop in February, March and April. But before we started growing in Mexico, in the late 1970s, we started in Salinas and then in the San Joaquin Valley. The Italian growers knew what to plant and we got all the varieties in the right mode that would do well. The Italians wanted to be partners again and I declined it because I had kids coming up, but I told them that I would buy all the seeds from them, and they were making good money. So they ended up disclosing the secret in the whole deal of growing radicchio. So without them, and me speaking Italian, we would have never gotten started. We are still friends today and I’m still buying seed from them,” Marchini said. Over the years, Marchini has worked with his son Jeff to plant the right seed at the right time. They learned which varieties could handle different climates, such as going into the heat, and coming out of the heat, and they emerged with 6 or 7 dependable varieties. “So we plant six varieties in the fall, one week after the other. We can have radicchio in the San Joaquin Valley from November until March, and we harvest seven days a week. His processors want radicchio 12 months out of the year, so Marchini’s company manages harvesting to fill the sales pipeline 12 months a year. “And we never run out of it,” he said. Today, Marchini uses about 12 different labels, including his own image on the ‘Joe’s Premium Radicchio’ box, for the domestic market and select export markets. “We let global importers pick their own labels. J. Marchini ships all over the world now, including Italy, and has a large percentage of the market in Japan, Korea and Taiwan. 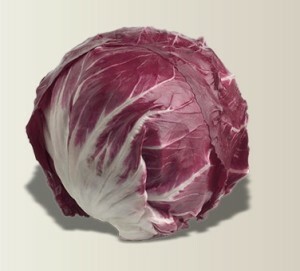 “They love the color of radicchio in a blend,” he said. J. Marchini deals with nearly every processor in California including Taylor Farms, Apio, Fresh Express, Dole, Earth Bound, and Ready Pac, year-round, with production from Kern to Merced counties and Mexico. Managing all this production with Joe and his son Jeff (the third generation), are grandchildren Marc and Nic and Francesca (fourth generation), with the fifth generation coming along with Gabriella, Maximus and little Giuseppe, named after his great-grandfather Joe (Giuseppe). Marc and Francesca work in the sales and post-harvest side of the business. Nic works in the farming operation side of the business. Jeff oversees the company as a whole. Overseeing production, and especially the harvest of the radicchio throughout the growing regions, including Mexico, is Alejandro Calderon, Joe Marchini’s right hand since day one. Jenny MacAfee, a key person in the sales department, has been on board for the last 20 years. Today Marchini farms three main radicchio varieties: Castelfranco (white head with red polka dot specks), Treviso (elongated red with white ribs), and Palo Rosa (red head type with white veins). “We do a three-pack deal in the wintertime with all three varieties together, but we also grow many other varieties,” said Marchini. J. Marchini Farms’ production operation, based in Watsonville, a great climate for radicchio in the summer months, includes 2,000 acres spread between the Central Valley, the Coastal areas and Mexico. The Central Valley fall and winter nighttime temperatures are cool, and radicchio production, five lines down the row on 80-inch beds, is about 20,000 pounds per acre, with most of it on drip or sprinkler. The operation also grows almonds, walnuts, fresh figs and other crops, “but radicchio has been a good ride,” said Marchini. “We have had ups and downs with the crop, but overall it has provided a good cash flow,” he said. For the last three years, Joe Marchini has been dealing with Squamous Cell Carcinoma (the second most common form of skin cancer) and has undergone multiple surgeries and treatments. His love for his family and his incredible passion for farming keep him going.